A nice way to come off the holidays (during which you've no doubt stuffed yourself senseless) is to see and understand just exactly where that food is going, where it went, and what it helps to do! Right? 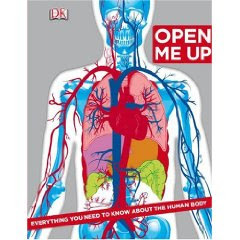 Open Me Up , published by DK Publishing, is a fun way to introduce kids to the wonders of the human body. It's not your straight forward science book with diagrams and arrows pointing out the various parts. If that's what you are looking for, this book is not it! This book is filled with caroons, photographs of body builders, illusions and body "network" systems. It's, well, "hip." It is sectioned into body systems, the most bloody being the one about, uh, blood. The reader learns about red blood cells on a blood spattered page that reminds me of CSI or something (only brighter colors). This is the kind of eye-catching book that engages the young person who thinks science is boring. Open Me Up , through its very title, would defy the notion that learning about the human body is dull. A little bit of manga, a few "fears and phobias" that you can learn about (i.e., amathophobia anyone?) and nervous system super heroes do their best to illustrate and inform the reader on the most complex machine on earth - the human body! I would say that this book is probably best suited for ages 9 and up. Some of the page layouts/illustraitons could be a bit "spooky" to a younger reader. This book also discusses the reproductive system so you would want to be prepared to talk about that with your young reader. However, if you are having a hard time making learning about the body fun - well then, look no further. Open Me Up takes you off the beaten path well enough to make anyone at least a little bit curious. Thanks, DK Publishing, for letting me check this book out! Yes, my 9 year old loves this one, and my 3 year old likes flipping through the pages a bit, too. :) Gotta love DK! I LOVE books like this. Glad to know there's something like this out there for when I have kids. One I loved as a kid was a book called Inspector Body Guard Patrols the Land of U or something like that. I think its out of print but it was kind of a precursor to the whole Magic Schoolbus exploring the body (if you remember that episode). This book looks like tons of fun. Thanks for the recommendation.